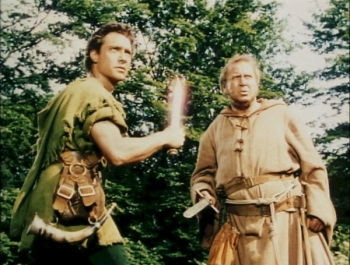 James Hayter played the title role and did it very well indeed – in that same year he was also Friar Tuck in The Story of Robin Hood and His Merrie Men so his two most famous roles in a long career, came in the same year. Noel Langley with only his first film as a Director, did a great job in this 1952 film, and captured the essence of the novel. He also did much of the adapting and writing of the script. James Hayter as Pickwick and Nigel Patrick as the charming swindler Mr Jingle head up a wonderful British cast. Wilkie Cooper’s black-and-white cinematography, Frederick Pusey’s art direction and Beatrice Dawson’s Oscar-nominated costumes make a stunning combination. It was made at Nettlefold Studios in Walton-on-Thames, Surrey, and features some unmistakably English scenery. 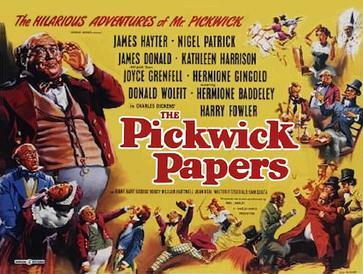 Just about all the actors chosen for the roles seem perfect for their parts, from Harry Fowler as Mr Pickwick’s faithful manservant Sam Weller (several of his famous Wellerisms are included) to Joyce Grenfell in a brief cameo as awful poet Mrs Leo Hunter, Hermione Gingold as indignant headmistress Miss Tompkins, Kathleen Harrison as the flirtatious Rachel Wardle, and Gerald Campion, best known as Billy Bunter, as the Fat Boy, Joe, who doesn’t get much screen time but makes the most of it. Other well-known British actors include Hattie Jacques, music-hall veteran George Robey in a brief scene as Sam’s father Tony Weller,and the first Doctor Who, William Hartnell, in a brief role as an angry cab driver. Mr Pickwick and his club members set off on their travels around England and land up in all kinds of comic trouble. Understated performance from James Donald as the terrified Mr Winkle. Who could forget the scene where Mr. Pickwick ends up in a lady’s bedroom by mistake after getting lost in the corridors of the Great White Horse Hotel in Ipswich. Above: Mr. Pickwick, Mr. Wardle and Mr Perker, the Lawyer, arrive at the White Hart Southwark. They are in pursuit of the eloping Rachael. 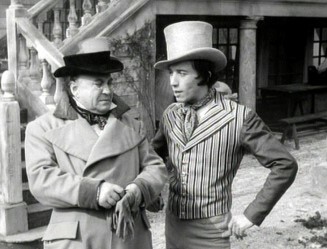 It is here that Mr. Pickwick takes Sam ( Harry Fowler) into his service. The breach of promise trial, Bardell against Pickwick, with Donald Wolfit who gives a storming performance as the lawyer Sergeant Buzfuz, and Hermione Baddeley also excellent as the bewildered landlady Mrs Bardell. 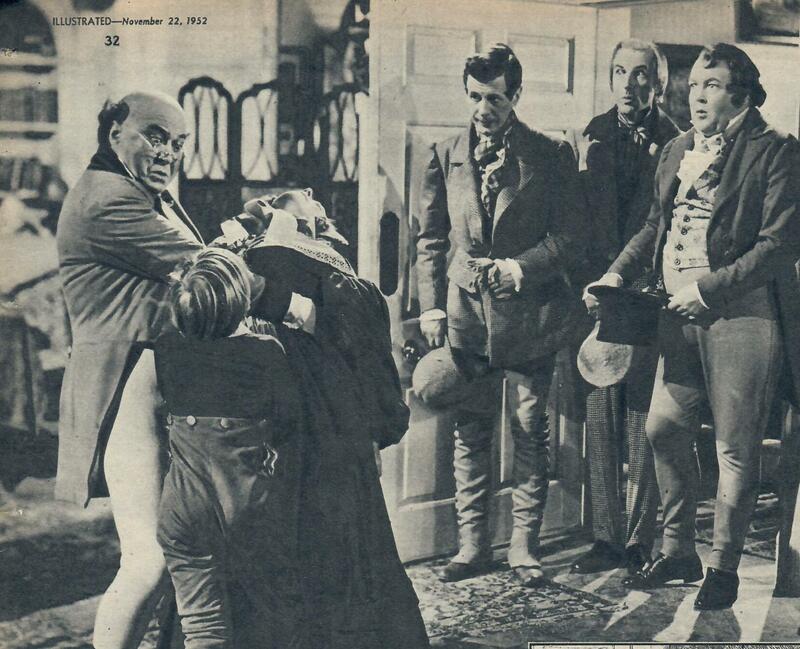 Another scene has Mr. Pickwick in the Fleet debtors’ prison. Nigel Patrick in particular shows his versatility as an actor in this section, as Mr Jingle turns up again, ragged, ill and starving but still with his famous clipped way of speech. It is the culmination of Pickwick’s journey of discovery through England. Of course, the sunshine breaks through again and there is a happy ending. Above: At the Bull Inn, Rochester, Mr. Pickwick mistakes his bedroom and finds himself sharjng it with a middle-aged lady played by Athene Seyler. Very accurate depiction even down to the candle. In the Pictures above and below we see how the film makers tried hard to be as faithful as possible to the original drawings by Seymour – which according to what I have read were done before the book was written – so it seems The Pickwick Papers was written from what appeared in the pictures rather than the other way round. Above: The scene is the arbour at Dingley Dell where Mr Tupman is courting Rachael watched by ‘the fat boy’. 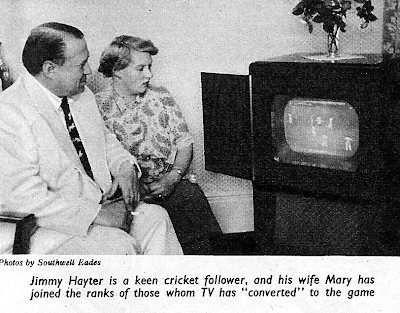 On the right Alexander Gauge in romantic pose with Kathleen Harrison – and Gerald Campion – famous as BBC TVs Billy Bunter standing assessing the situation. To the LEFT – again the original sketch from the novel - very accurate. His longest-running stage role (8 times a week, 2,415 appearances in total) was Alfred Doolittle in My Fair Lady, taking over from Stanley Holloway in the original Drury Lane production of 1959 and playing for 5 years in the West End and on tour. The London News Chronicle wrote: “Hayter is a chubbier, kindlier old rascal of a dustman, with a lovely bronchial wheeze and a tragic look of glassy misery when in the thralls of middle-class morality”. 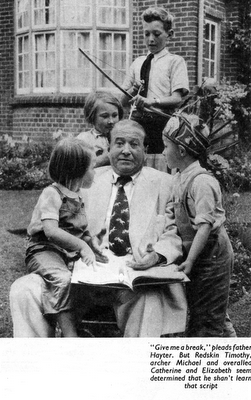 James Hayter appeared in over 100 films, among his more notable being Big Fella with Paul Robeson and Elisabeth Welch, The Crimson Pirate with Burt Lancaster, Land of the Pharaohs with Jack Hawkins and James Robertson Justice, Nicholas Nickleby in which he played both Cheeryble twins, The Verger – one of Somerset Maugham’s Trio, Pickwick Papers (leading a marvellous cast including Nigel Patrick, James Donald, Kathleen Harrison, Joyce Grenfell, Athene Seyler and Donald Wolfit), Walt Disney’s The Story of Robin Hood and his Merrie Men with Richard Todd, The Blue Lagoon with Donald Houston and Jean Simmons, and Morning Departure with John Mills and Richard Attenborough. His extensive television work over the decades included the lead in Pinwright’s Progress, British television’s first authentic half-hour situation comedy series; a mad train conductor hell-bent on the assassination of the Prime Minister in an episode of The Avengers (Diana Rigg vintage); and James Onedin’s doughty father-in-law in The Onedin Line. He was delighted to be brought in for the sixth series of BBC Television’s Are You Being Served? as the cantankerous Mr Tebbs, but J Walter Thompson were soon in touch with his agent to communicate that their Kipling Cakes account was less thrilled with the shadow it might cast on the avuncular and long-established image of Mr Kipling, and he was consequently bought out of the programme for an agreed sum. Having worked long and hard at his profession, James Hayter was well pleased to be paid for not working! He was sustained in his later years by voice-over work. Readers will recall his most famous line from a TV advertisement, “Mr Kipling does make exceedingly good cakes!“. James Hayter retired to Spain in the early 1970s, and flew back to the UK when work beckoned, but died in his sleep in 1983 at Villajoyosa at the age of 76. With eight children to support, life had not been without anxiety, but he had enjoyed his last years in the sun.